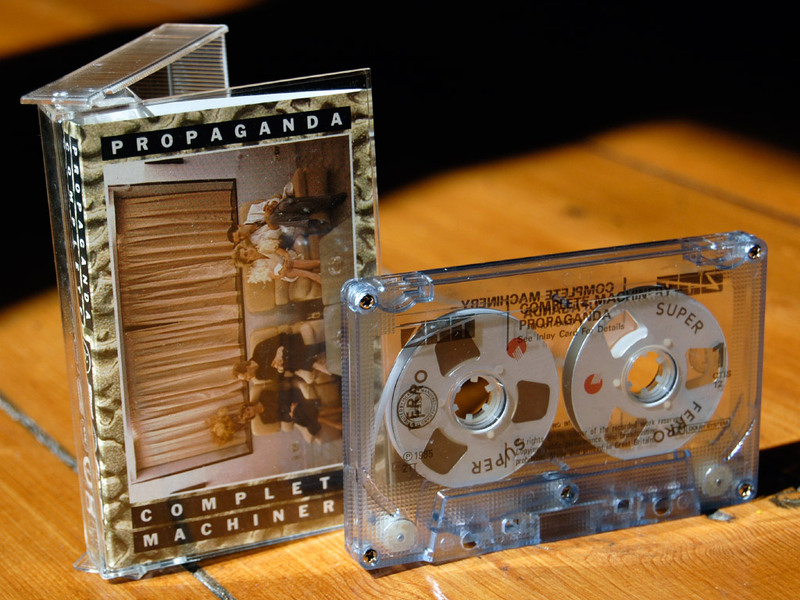 A particularly fine example of ZTT and their multi-format splendour that helped to foist Propaganda into the consciousness of the world with the polished perfection of ‘P:Machinery’, styled here as ‘COMPLETE MACHINERY – A CASSETTE COMPILATION OF PROPAGANDA’S THIRD SINGLE’. It was one variety of the first outing for ‘P:Machinery’ as a single in August 1985, which came with standard 7″ and 12″ formats plus this lovely cassingle. (It would soon be joined, in the UK at least, by clear vinyl versions and a ßeta mix 12″ not long after – and then, just before the year’s end, a second life in ‘Reactivated’ remixed 12″ and 7″ form… but that’s another story…) A QUARTER HOUR OF ‘P: MACHINERY’ PLUS ‘FROZEN FACES’, the inlay card for this card spells out nice and clear in capital letters. COMPLETE MACHINERY IS NOW NUMBER 107 IN AN INCIDENTAL SERIES. BETTER STILL IT IS A PART OF NUMBER TWELVE IN THE ACTION SERIES, it adds further. ‘Introduction’ is a short 25 seconds or so snippet of vocal – Play, Prepare, Punish, Persist, Ply, Profit, Position, Propaganda, Perform, Machine – while ‘P:Machinery (Connected)’ is an exclusive mix, conjured up from parts of the original P:Machinery and the Passive and Polish mixes of same. ‘Separation’ is another short interlude, freeze-framing the machine beat rhythm bed and marimba-like sequencing – after a short break there is then the longer mix of the wonderful (and at this time exclusive to the ‘P:Machinery’ singles) ‘Frozen Faces’, as found elsewhere on the original 12″ edition. 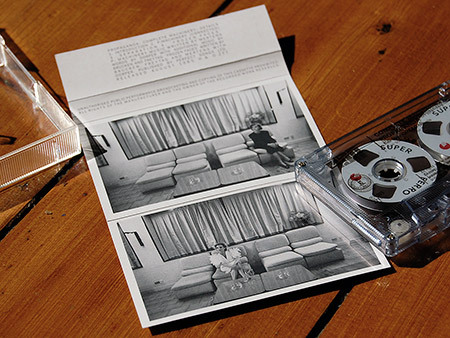 ‘P:Machinery (Connected)’ has since seen release on a couple of CDs – firstly on the German edition of the ‘Outside World’ compilation, it warranted the following fair warning on the cover: ‘A very rare track remastered from a tape recording, as the original master is not available. It is included on this set for its merit as a collector’s item. You may find that the sound quality may differ from the other tracks on this CD.’ Winding the clock forward to 2014, it saw another outing in improved quality on ‘The Art Of The 12″, Volume Three (A Soundtrack For Living)‘, the third volume of various mixes cobbled together under a nominal ZTT umbrella (at least this had some provenance, unlike a good few others on the admittedly well put together compilation). This entry was posted on Wednesday, January 27th, 2016 at 9:06 pm	and is filed under Cassette pets, Small objects of desire, Versions, versions. You can follow any responses to this entry through the RSS 2.0 feed. You can skip to the end and leave a response. Pinging is currently not allowed. Whaaaaaat…?! 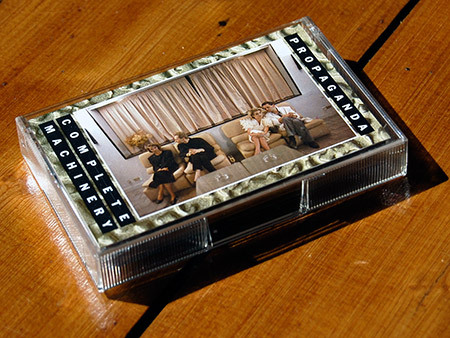 You utter the word “cassingle?” Surely they were only referred to as “Singlettes” in the hallowed halls of ZTT? That one is exceptionally beautiful. 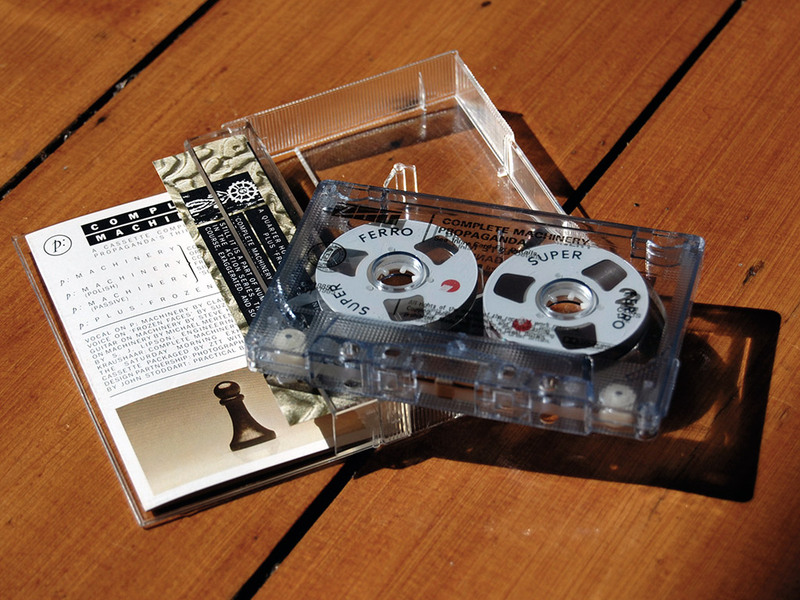 Alas, I only own the “Duel” singlette, which came in a black plastic shell sans the oh so suave tape reels. I’ll gather that they worked far better with scant amounts of tape on them than their deeply flawed C-90 cousins. Those reels usually had more tape wound on them that the reels allowed in longer formats; giving rise to serious problems very quickly. C-20 amounts of tape should have worked flawlessly. Well spotted, singlette should indeed have been the terminology! The ‘P:Machinery’ cassette is the finest of the various singlettes as far as the aesthetics go, I think. I know they are not your preferred medium, but at least ZTT made a go of making them unique.